Make no mistake, the Rohloff is at the head of the class of Internal Gear Hubs. On the surface 14 speeds don't sound as exciting as 30, but when you consider that 15 of the 30 overlap, 30 is more like 15. So the Rohloff pretty close to most 30 speeds. Rohloff is the Rolex of Internal Gear Hubs. Riding a tadpole with your ears a bit more than a foot away from the Rohloff you might appreciate the hum of so many gears spinning after looking at this cutaway. Make no mistake, despite the serene silence of the Alfine 11 the Rohloff lets you know its filled with fine German steel gears. Pricey, in a word yes. Ranging from $1300 online and up, its almost amazing that anyone can build such a complex unit and sell them without taking a loss at that price. Generally regarded as "bombproof" they rarely have any failures even when pushed beyond the factory recommended gearing limits. Using about an ounce of oil for lubrication the oil change interval is 3000 miles. Extensive use of ball and needle bearings keeps friction to low levels considering the vast number of rotating engaged gears. To achieve 14 speeds there are 7 primary gearsets and one secondary gearset. 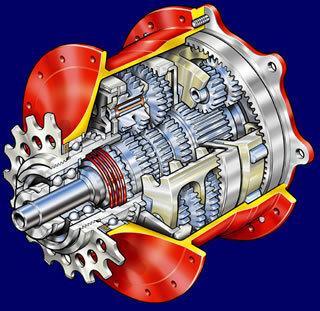 In the lower range the 7 gears are engaged through the secondary reduction gear, and the second set of 7 gears are directly driven without a secondary reduction. Therefore when shifting between gears 7 & 8 there is a bit of hesitation as it takes a shift for both primary & secondary gearsets. The hub weighs in at a frog hair over 4 lbs giving it just over 1/4 lb per gear. That's exceptional when compared to the Alfine 8 which is about twice the weight per gear. Shifting the Rohloff requires two cables that come with a proprietary twisty. Yet another oddball cable pull of 7.4mm. If the twin cable shifty is bothersome, for a mere $600 you can order an electronic button shifter from ShiftEzy. The hub is available in silver, black, and anodized red, with either bolt-on or quick-release skewer options. Or you can calculate the gearing and speeds using Gearmaster and selecting the Rohloff tab. With 13-14% between steps its not exactly close ratio, but not too wide either. Up hills there is no spongy feeling like with the Alfine, maybe due to the thicker wall ring gears. Shifting under power takes some practice because it sort of sticks if it's shifted with a little too much pedal pressure. Power shifts are probably the weakest point of the gearbox, followed by the noise factor. New Rohloffs feel very draggy with break-in taking about 1000 miles. After they're broken in you won't notice much (if any) of a speed differential from an equivalent range derailleur. Once you've installed a Rohloff, you'll no longer yearn for a gearing upgrade. Whether that's the experience the Rohloff offers, or the clams you just paid for the Rohloff doesn't matter as you'll find a way to love it.